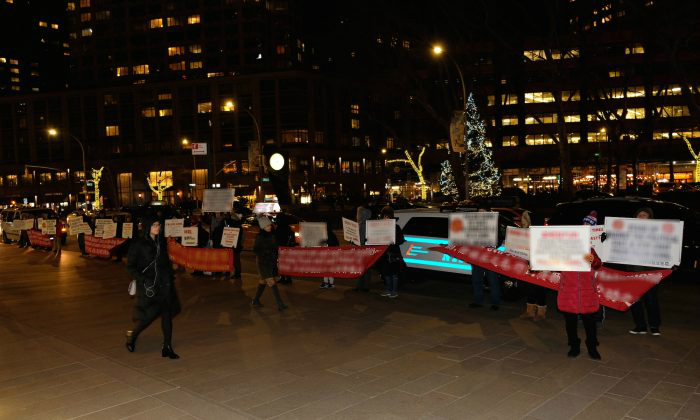 NEW YORK—As theater-goers were preparing to watch a performance melding traditional Chinese dance and Western music at Lincoln Center on the evening of Jan. 10, they were greeted by a sight one would expect to see outside a political convention rather than a high-end theater. A group of protesters belonging to a Chinese Communist Party front group had gathered outside to hold up placards with propaganda slogans and hate speech against one of the companies performing inside. They belong to the Chinese Anti-Cult World Alliance (CACWA), a group that has harassed and intimidated local adherents of a spiritual group that is currently banned and heavily persecuted in mainland China. As the front group’s banners and placards reveal, its target is Shen Yun, a New York-based performing arts company that is currently on a worldwide tour. The company is performing at the David Koch Theater in Lincoln Center from Jan. 10 to 20. According to the company’s website, Shen Yun’s mission is to revive 5,000 years of Chinese civilization through its performances of traditional dance, as well as live orchestral music. As part of Shen Yun’s representation of modern-day China, some of its dances portray the ongoing persecution of the spiritual practice Falun Gong. Beijing’s apparent fear of its campaign against the practice being revealed to audiences has fueled its attempts to stop Shen Yun wherever the company performs. Oftentimes, that interference involves the local Chinese consulate and diplomats, who have pressured venues to not lease their space to Shen Yun, or have attempted to coerce Western government officials to not voice support for the company or attend its performances. In New York City, Beijing has turned to the CACWA, which has disrupted Falun Gong practitioners’ events since 2008. Based on the principles of truthfulness, compassion, and tolerance, Falun Gong, also known as Falun Dafa, attracted tens of millions of adherents in China soon after its introduction in 1992. The popularity of the practice—and the fact that it didn’t conform to communist orthodoxy—led the Communist Party leader at the time, Jiang Zemin, to launch a nationwide campaign in July 1999 to eliminate it. Jiang established a secret police force, called the “610 Office,” dedicated to carrying out the persecution, including by tracking down and detaining practitioners. While CACWA does not have an official website, its activities disrupting Falun Gong are routinely reported by the 610 Office’s website, Kaiwind.com, using language vilifying the practice and its adherents that corresponds to propaganda the Chinese regime has promulgated since 1999. One article on Kaiwind.com describes how CACWA was established in 2008 after an incident in Flushing, Queens, where, according to The Epoch Times’ coverage at the time, a group of Falun Gong practitioners attending a rally were attacked by roughly 200 to 300 individuals who began throwing objects and shouting threats and insults at the practitioners. The Kaiwind.com version of the story is that Falun Gong was disrupting donation efforts for the Sichuan earthquake in 2008. That year, the Chinese consular general in New York, Peng Keyu, was caught boasting, in a secretly recorded telephone call, about how he had organized angry mobs to besiege Falun Gong on the streets of Flushing. CACWA is thus suspected to have close ties with the Chinese consulate. Since then, a lawsuit filed by local Falun Gong practitioners alleges that CACWA members have continuously intimidated adherents over the years. At one point on Jan. 10, several tried to move off the staircase leading to Lincoln Center and onto the square where the center’s theater venues are located. New York City police told them that they could not move beyond the stairs. The protests did not seem to affect Shen Yun audiences. Some high-profile attendees, including journalist and correspondent for CBS Rita Cosby, praised Shen Yun’s artistry. Cathy He contributed to this report. Over 100 theater-goers angry after finding out Shen Yun show cancelled due to CCP pressure.